Natural dyed yarns. Left to right: Wool & baby alpaca blend dyed with madder extract, hand-spun Oxford Down dyed with teal, with madder and with onion skins, superwash merino dyed with onion skins. To make up for the less than successful lichen dyeing attempt, I dyed a few skeins with some other, more reliable natural dyes, and I’m so happy with these beautiful autumn colours. All yarns were pre-mordanted with alum and cream of tartar. The onion skins were brilliant as ever! The two skeins on the right were in the same dye bath, both pleasing yet very different shades. 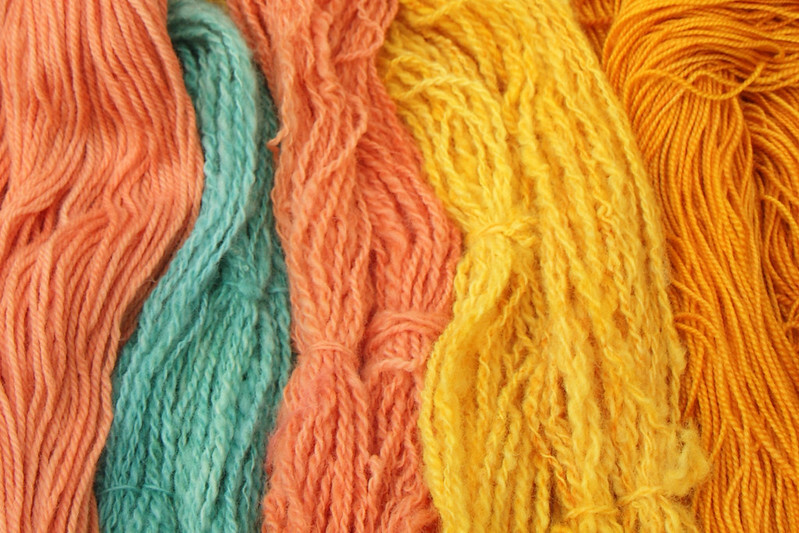 You can see the difference that the superwash treatment makes to colour absorption, the superwash merino having turned a deep gold, and the untreated a bright yellow. I used a small freezer bag full of onion skins for about 150g yarn (and probably could have done more). I have written a tutorial for dyeing yarn with onion skins, if you’re curious about natural dyeing I urge you to have a go, the process is very easy and rewarding. The teal yarn was dyed with an extract I bought from DT Crafts, which they no longer sell. I’ve been unable to find out any information about what this unusual colour is made from and it’s a real shame not to be able to get more. I will save what I have left for something special! This was the first time I have used madder extract, and I was impressed with how well the colour took. I used about 3g for ~130g yarn. With the acidic cream of tartar modifier I used madder gives soft orange shades, apparently chalk can be used instead for deep pink tones, which I will definitely try next time. 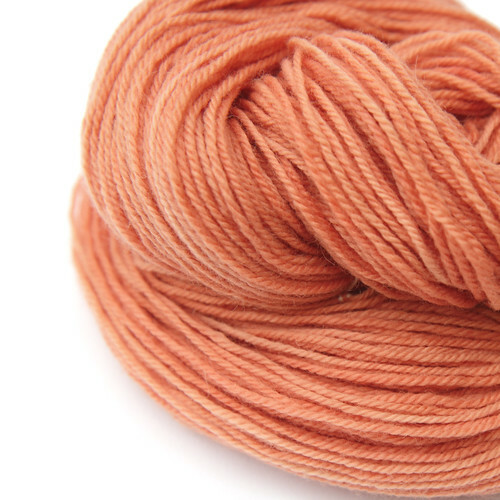 I’ve put the organic wool and alpaca blend skein dyed with madder in the shop. Sadly the other skeins are a little small to sell as they’re all under 50g, and the superwash merino was a damaged skein with more knots than I’d be comfortable selling. I am really interested in producing more natural dyed yarn to sell but I am down to my last few skeins of undyed yarn. Sadly my usual supplier has stopped offering consumer quantities and their minimum wholesale order would be a considerable investment for me, and also impractical for me to store as I dye in very small batches. I have tried a few alternatives but either the quality hasn’t been right or it’s been too expensive to justify home dyeing. I’m looking for a British supplier with good ethical credentials. I am considering buying a larger batch to either split with someone else, or sell undyed yarn myself by the skein or half kilo. If you would be interesting in buying undyed yarn or you can recommend a supplier, please comment or get in touch! I would love to know if there is a market out there.